When I say “shabby chic nursery style,” I bet you immediately think of a pink room with roses, ruffles, old frames, vintage wall art and sweet pastel accents. Okay, I do too, but that is exactly what has made this style of décor so popular! It’s timeless, and you can add your own touch with DIY projects and vintage treasures. Personally, I like a little more color in a space than the traditional baby pink and white, so here are a few ways I’d add some fun to a shabby chic nursery. I’m obsessed with this vintage fabric garland. You could use the word “love” or even personalize it with baby’s name. This garland is the perfect size to hang over the changing table, and it would be so easy to make your own version with scrap fabric and ribbon! Vintage frames are another classic example of shabby chic décor. I love the idea of finding old frames and painting them yourself, but you can achieve the same look with a pre-finished set of shabby chic frames. Pay attention to the details—see how the frames below have gold accents? You can create the same look by using a gold rub you can find at craft stores—instant shabby chic nursery décor! 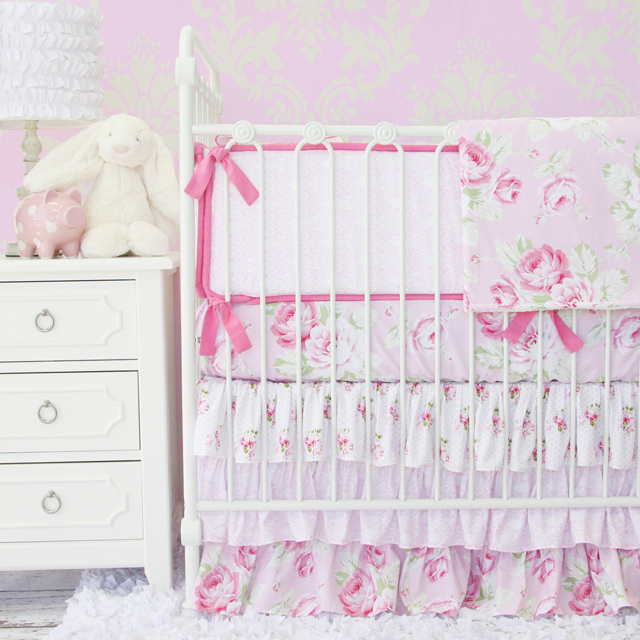 You can’t have too many ruffles in a shabby chic nursery, and this ruffled crib bedding has layers of pretty fabrics and soft ruffles. I love the pop of bright pink—it’s the perfect accent to the pastel fabrics. You know all that ugly furniture your grandma has in her garage? Well, call dibs on it now—there’s nothing a coat (or two) of chalk paint can’t fix! One of my favorite rules in nursery design is that the furniture shouldn’t match—instead, try adding an interesting twist to your décor with a painted piece. I love the chicken wire windows on this pink painted armoire—it’s so creative and adds to the shabby chic style of the space! Don’t forget the finishing touches! Every shabby chic nursery needs a vase of flowers. So whether you have a green thumb (I don’t, so mine would be fake) or find a beautiful bouquet at the market, stack some of your favorite books on the dresser, and top it with the flowers for instant shabby chic décor. I’d love to know what you think about my favorite finds for a shabby chic nursery—will these items add a modern twist to the classic style? Adore these lovely selections! The soft pastels…swoon! What colour are those picture frames? My mom wants to paint my dresser the colour of my nightable and my nightable is that shade of green. By the way I love the way you put designs and colours together.